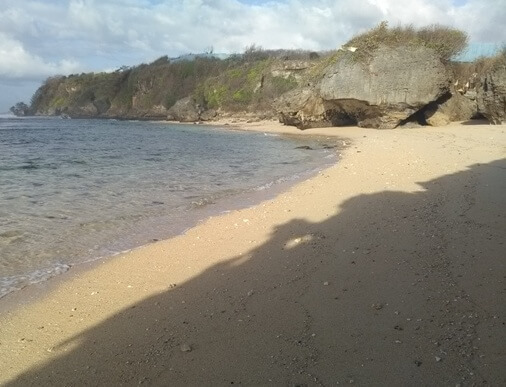 Pura Geger Beach is a hidden gem, one of the best kept secret around Nusa Dua. 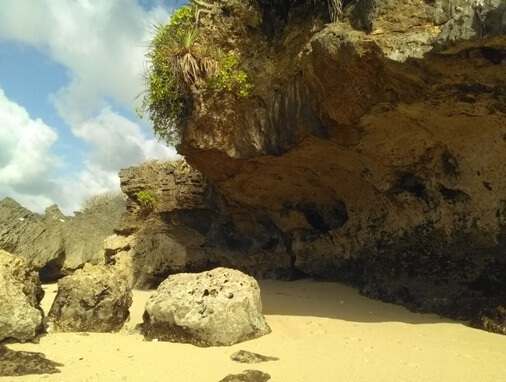 A white sandy beach hidden at the base of the high cliff, with panoramic views of the blue sea, crystal water, dense green vegetation and tranquil atmosphere. At least this beauty remains until now, though only a little. 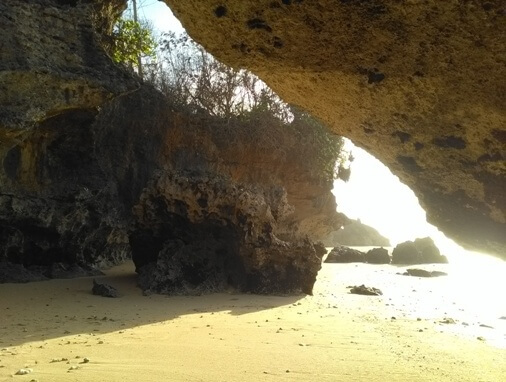 This beach is located in Peminge Village, South Kuta district, Badung regency, Bali. It's less than 30 minutes from the Ngurah Rai International Airport. This spot can be accessed easily by car. Just drive south-east via the Bali Mandara Toll Road heading to Nusa Dua, and continue on the Jl. Raya Nusa Dua Selatan. You will pass several luxury villas such as Mulia Villas, Sekar Nusa Villas, and VOUK Hotel before finally reaching the entrance, the Jl. Pura Puget (Jl. Pura Geger). Follow this road (about 650 meters) to Pura Geger, a beautiful Balinese temple located at the very end, and you have found it. There is extensive parking in front of the temple and some food-stalls who sell foods, snacks and soft drinks. From parking visitors can enjoy the fresh atmosphere and views of rock cliffs with beautiful vegetation. A little walk to the south, you will be greeted by a view of the blue sea, crystal water and stunning waves. This beach is still quiet. During the high tide, the wave directly hit the cliff side and there is no beach at all. But at low tide, you will be fascinated by its beauty, a long arc of white sand at the base of the cliff and sea water that is so transparent. Some stairs will tempt you to explore pristine beaches, cliffs, rock gaps, caves and rock formations that have been eroded by water. You can find secret spots to relax while enjoying views of the sea. If you're lucky, you can enjoy all this beauty just for yourself. At low tide, this is a great place to hang out or picnic with family. 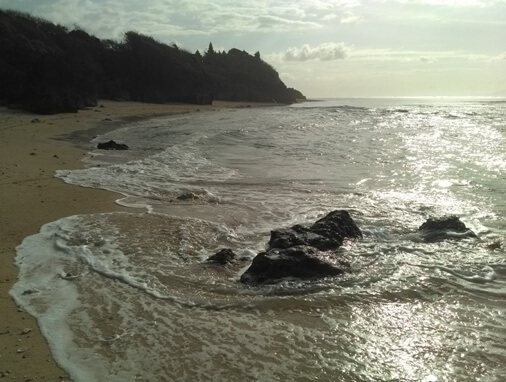 This beach is great for enjoying the sunrise, morning jog, stroll along the sandy path and enjoying the sound of waves in the crystalline sea. This spot is great for photography lovers with the charm of golden hours from the rock gap and cliffs. This is also good for surf fishing. Some surfers are spotted watching wave conditions. This spot has good waves for surfing and is recommended for experienced surfers. 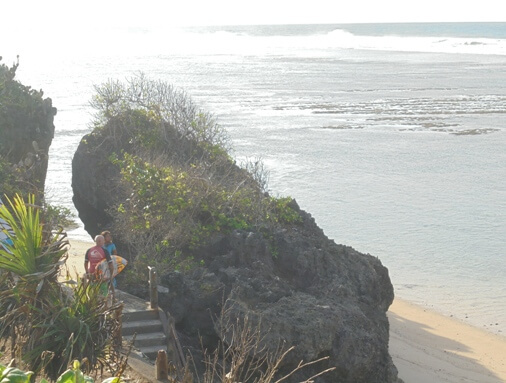 It's also close to other spots such as Nusa Dua, Srilanka, and Mushroom Rock. You can swim near the beach, snorkeling, or sunning and enjoy the beauty and serenity of the pristine beach. Try to dip your toe into the sea water; it's really fresh! Please be mindful of the tides as the currents can be strong! 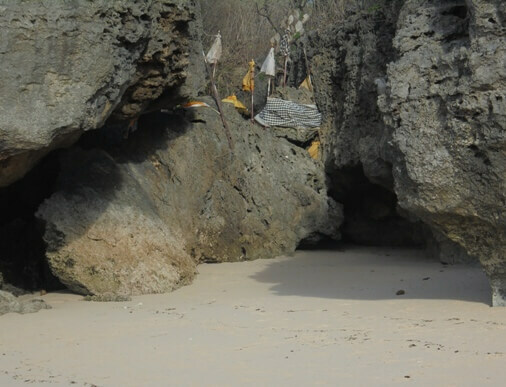 In addition there is Pura Beji, covered by the black and white checkered cloth, hidden behind cliffs and boulders. Balinese usually perform purification rituals here and are seen to be sacred. You can find a number of unique creatures like: cattle, monkey, kingfisher, and stray dog. 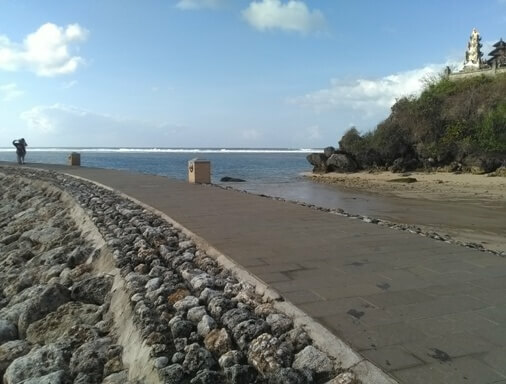 The existence of Pura Geger has become a cultural landmark of Nusa Dua. Pura Geger is included as the Dang Kahyangan Temple, which has great spiritual significance. This holy temple perched on top of the headland with an astounding view and magical. 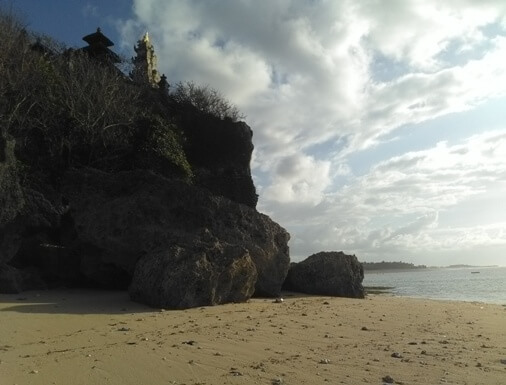 The beach around the temple is not spared from the development of accommodation facilities (hotels) even though it has been arranged in Radius Kesucian Pura (Sacred/Holy Area). After the development of Mulia Hotel on the north side, at this time (when this post published) on the south side, just a few meters from the stairs to the beach below, the blue noise barrier has been installed. Sadly, above the Pura Beji also did not escape the noise barrier installation. Sources mentioned that landowners make land arrangements, but are temporarily stopped by the government regarding licensing. Perhaps in the future this seascape will change even more. The beauty that still remains today will be very valuable to remember. I hope that we can still enjoy it.